The Buran space shuttle's design was similar to U.S. space shuttles. The Buran spacecraft was a space shuttle developed by the Soviet Union in response to NASA's space shuttle program. Buran, which means “snowstorm” in Russian, flew one time. NASA's space shuttle represented a new form of development for space vehicles. Up until 1982, space vehicles — even those that carried humans — were launched for only one mission at a time, except for certain military test programs. A shuttle, on the other hand, could be used multiple times and reduce the cost of space exploration. NASA's focus was on reducing space costs, while the Soviet Union viewed the space shuttle as a potential military threat, wrote Anatoly Zak on his website, RussianSpaceWeb.com. The Molniya Research Industrial Corporation, which developed the Buran's body, said the goal was to send 30 tons to space and return 20 tons to Earth. Buran was supposed to hold up to six passengers in its crew cabin. A separate cargo department would allow for satellites up to 17 meters (56 feet) long and 4.5 meters (15 feet) in diameter. Additional crewmembers could ride in the cargo area. Similarly to NASA's space shuttle, Buran would have different kinds of thermal materials on its surface to shield from the stresses of re-entry. Buran performed 24 test flights on Earth (including 15 that were fully automatic) in preparation for its space test flight, Molniya stated. 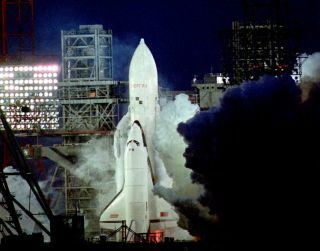 Buran launched only once into space, on Nov. 15, 1988, and re-entered the atmosphere after two orbits, according to NASA. The spacecraft launched aboard a Russian Energia rocket and successfully touched down under automatic control, something NASA's space shuttle was not designed to do. Buran launched at a difficult time for the Soviet Union. Just a few years later, in 1991, the Communist government fell and the nation broke up into several countries. The program itself was put on ice because “the Soviet Ministry of Defense fully realized the lack of purpose for the system, compared to its tremendous cost,” Zak wrote. By 1993, the head of NPO Energia (Yuri Semenov) said the project was cancelled. Molniya considered another version that would be a bit smaller, but the idea was never pursued because of a lack of investor interest, Zak added. Just nine years later, the only Buran used in space was destroyed after the roof fell in at its storage facility at the Baikonur Cosmodrome in Kazakhstan.